It is considered to be the best skin food as it not only hydrates your skin but also provides it with a good amount of oxygen. Brown rice is a rich source of vitamin B, protein, magnesium and several antioxidants. For acne, vitamin B acts a stress fighter, which helps regulate hormones levels and prevents the likelihood of breakouts. Garlic is another superfood that helps fight inflammation and is full of a naturally occurring chemical called allicin, which kills off harmful bacteria and viruses your body might be fighting, so it’s proven to be good for reducing inflammation. Broccoli is the perfect skin clearing food. It contains health building properties like vitamins A, B complex, C, E, and K. These antioxidants fight radical damage which will assist with the luminosity of your skin. This tasty green fruit, rich in vitamin E, called as skin vitamin. Avocado is also a good source of vitamin C, which can reduce skin inflammation and naturally moisturise the skin. Known to be a very good source of omega-3 and 6-fatty acids, it is excellent for acne prone skin, these acids reduce inflammation in the skin. Sardine and salmon are very good for the skin. 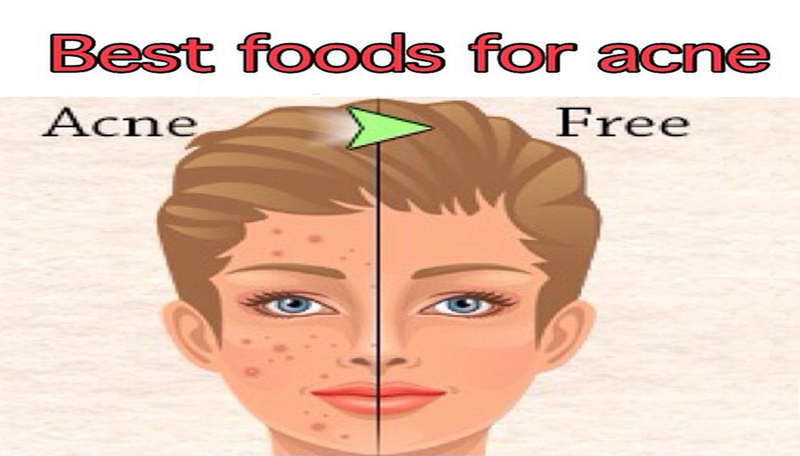 Deficiencies in minerals such as zinc and selenium have been linked to acne. Most nuts contain selenium, vitamin E, copper, magnesium, manganese, potassium, calcium and iron, which are all essential for healthy skin. If you’re looking for the perfect natural skin cleanser, eat fennel. This licorice-tasting root vegetable can improve digestion, reduce swelling and help to flush out excess fluids and toxins in your skin. High-fibre foods including oats, oat bran, fruits, vegetables, and whole wheat bread and pasta are all high in fibre and other skin-loving vitamins and minerals. Studies show that green tea helps fight acne. Drink green tea throughout the day, and try applying cooled tea bags or a cloth dipped in cooled green tea to acne-prone areas of your face for 10-15 minutes. Carotenoids are used in anti inflammatory drugs for treatment for acne.